Forest schools originated in Scandinavia as a way of bringing the school curriculum into the outside classroom. They provide children with the opportunity to take risks and reconnect with nature in order to grow as individuals and direct their own learning journeys. Forest Schools use the natural enivronmet to inspire a sense a sense of awe and wonder helping children not only to learn about the world in which they live but also to look at issues of conservation in a real and meaningful way. Running this summer in Leigh Woods, on the outskirts of Bristol, I'll take the children on an adventure of a lifetime. The ancient woodlands provide a perfect backdrop for den building, camp fires, rope swings and exploration. Each day is structured differently so we learn about the natural world, making musical instruments, cooking, den building and orienteering and other outdoor skills. For a party to remember 2 hours of fun and excitement tracking animals, finding the best climbing trees and a mini-beast safari. We'll take plaster of paris prints of any tracks we find as a special party souvenir. Bring some marshmallows to cook on the camp fire! 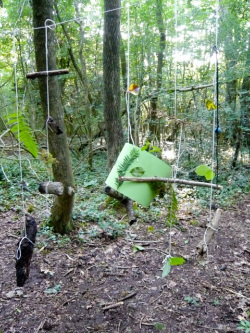 As a qualified teacher I can cover PPA time in schools or indeed take a class out to Leigh Woods for a stimulating fun day of Forest School activities. All sessions are Risk Assessed and linked into the EYPS or National Curriculum. I run Forest School in all weathers as shelters can be constructed, hot drinks are provided and lots of games will be organised to keep warm!